A user is anyone working with the ROBOTILL system. It can be a cashier, waiter, supervisor or administrator. To add a new user, go to ROBOTILL Manager > Setup > Users. Click on 'Add User' or 'Edit User'. Select a user role. You will need at least one Manager user. See the note below on user roles. The username needs to be unique. If you have more than one user with the same name you could for example use the name and first letter of the surname to make it unique. The PIN or Card Number is used for logging into the POS Applications. If you are not using employee cards it is suggested that you only use a number so that the user can also use the on screen keypad to enter his number. The number (PIN) can be any length. If you are using barcoded employee cards it musbt be the barcode. If you are using a card reader it must be the information that a card reader returns when that employee's card is swiped. The password will only be available if you select Manager or Supervisor as a user role. The password is only used for logging into management applications (ROBOTILL Manager and ROBOTILL Branch Module). The name and surname of the user is optional. Managers and optionally supervisors (depending on your settings in task security) are the only users that can log into ROBOTILL Manager. In the POS applications you can choose what each user role can do see Task Security. You can use a card system to log in users instead of usernames and passwords. The card system can be any card system with a reader that will return a unique employee number to the computer. If you don't have a card reader, you can also simply print barcodes (containing the employee numbers) on pieces of paper that you laminate for employee cards. You can then use your barcode scanner to scan the employee card. If you want to use a card system to log in users, you need to enter the Card Number for each user. A card number is the number on the card that will be returned each time the card is swiped or scanned. In Manager, under 'Main Setup', select 'System Configuration'. 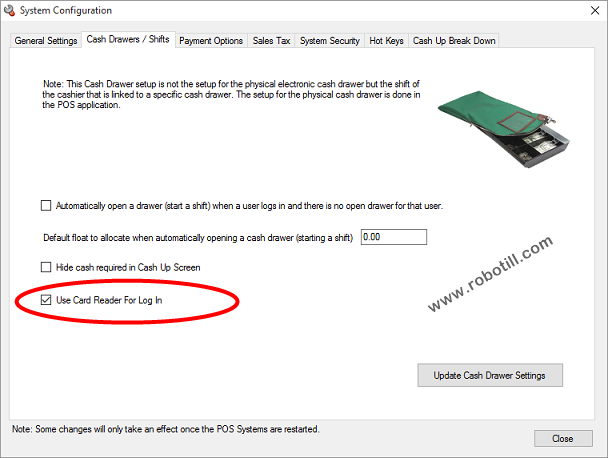 Go to the Cash Drawers/Shifts tab and check the box that says: 'Use Card Reader for log In'.